Many businesses adopt VoIP to take advantage of the cost savings without spending enough time reviewing the features and benefits made available by different solutions. If this is true for your business, there’s a good chance you could be getting more from your VoIP system in the form of even lower costs or improved employee productivity. You may even find that your current software offers features that you aren’t taking advantage of! 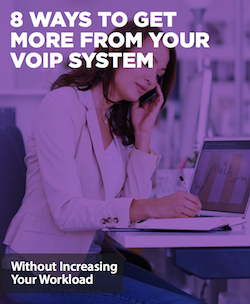 Read our latest guide on 8 Ways to Get More From Your VoIP System Without Increasing Your Workload to learn more.